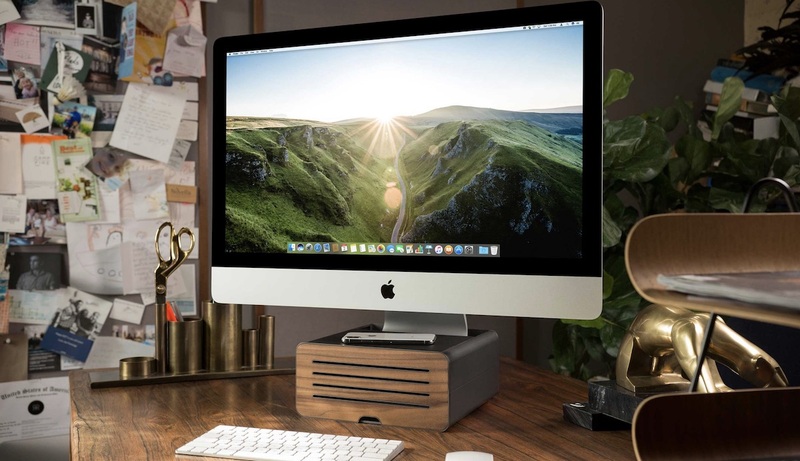 Apple accessory maker Twelve South today launched an updated version of its HiRise Mac stand, called the HiRise Pro, which it's selling for $149.99. 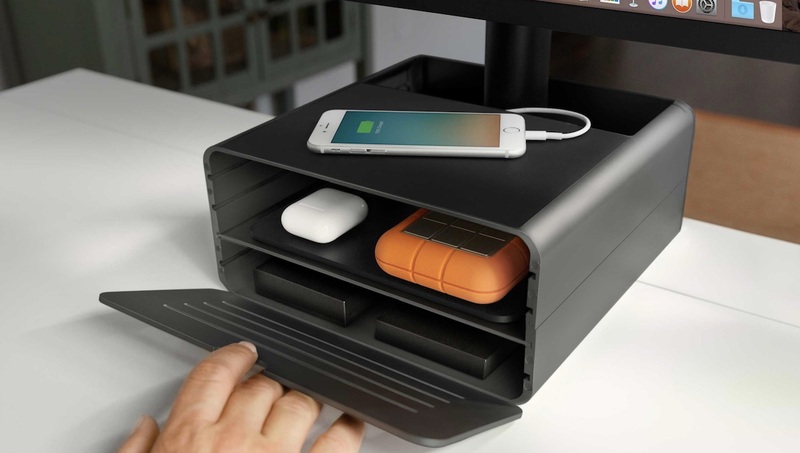 Similar to the previous iteration, HiRise Pro includes an adjustable height design (with 1-4 height options) and doubles as a storage space to reduce desk clutter. To better integrate into multiple design spaces, Twelve South's new accessory now comes with a double sided front plate in gunmetal and walnut, which you can flip over easily to pick the color you prefer. The company has also included a padded leather top valet on the HiRise Pro so you can safely place your iPhone on the ledge while you work, and don't have to worry about scratches. Twelve South's series of HiRise products are built as an ergonomic solution to reduce neck and back strain when you sit in front of an iMac or other external display for long periods of time. The adjustable height allows you to place your iMac's screen at a more even eye level, and the product will work with any iMac and Apple-supported external display with a base width of 10 inches or less. The new double sided front plate is magnetic and includes small grilles to ensure that hard drives that may be placed inside the storage compartment have enough air circulation. When opened, the inside of the compartment includes two ledges for storing items, with the middle adujstable ledge also providing the landing space for the iMac's base. Those interested can purchase the HiRise Pro from Twelve South today for $149.95. The older version is still available to buy for $79.99 as well. I found that the Steve Jobs biography by Walter Isaacson (Hardback version) placed under the "foot" raised my iMac to the perfect height for a fraction of the cost. As a representative of not-tall users (5’5" and under) the ergonomic challenge is often lowering the screen, not raising it. My iMac at home works because of a maxed out height chair + cushion + footrest. My 30" Cinema Dispaly has those accompaniments plus a custom built work table. Looking UP at a screen would be a recipe for physical disaster. Looking AT such an unesthetic and useless design just hurts my soul. Marquis Brownlee had this same mention in his review this morning. You cannot tell me this is not a paid advertisement for 12 South. The article was prepackaged with professional pics and it’s not even a review, it reads like ad copy. Nobody is saying that Macrumos can’t have advertising, but it is illegal not to disclose pay for play like this. I'm not a "monitor on a riser" kinda guy. For those that are, and also own an iPhone 8, 8 plus or X (or I guess some flavor of Samsung? ), it would have been nice if they included wireless charging capability in that top leather ledge. Set your phone down, charge your phone. A lot of monitors from other manufacturers can be raised - and lowered - without having to purchase a third-party accessory. Wow that thing is hideous. And $150 for an ugly glorified stand/shelf? They are out of their minds. Although I am sure someone will pay for it. But it is ugly ugly ugly. And no amount of money will change that. For $150 I’d expect better! Such as wireless charging on top when you set your phone on it.